Being an avid sewer all her life, Linda has taken her skills from dressmaking to creating wonderful traditional quilts using today’s faster techniques and tools. She believes there’s always something for everyone when it comes to quilting, and that quilters have a strong bond unlike anything else. She lives in Palo Cedro, a country community just outside Redding, where she raised her 2 children and still resides with husband Dave. Linda was a quilt shop owner in Redding and now travels throughout the country teaching both on land and sea. She has a fondness for quilt shops, but loves to teach at Quilt Festival, conferences, cruises, quilt guilds and camps. She says ‘anyplace and anytime, I’m ready’! Linda is known for the quilting retreats that she sponsors in California, and has been known to travel around the country offering her expertise on retreats whenever she’s asked. She has been featured in a variety of quilting magazines with her quilts, her patterns and as ‘ad’ quilts for a specific line of fabrics. She’s also had the privilege of being on Simply Quilts for two different seasons which means plenty of reruns. Linda will tell you constantly ‘to be flexible and go with the possibilities that are presented’. She always finishes with one simple word …. ENJOY! That’s how it should be for all of you who quilt. Her topic at our March 20 meeting is “What If,” exploring fabric values, different borders, etc. March 21 Workshop: You Need a Rita! Don’t you just love this name? And with this name should go a really fun quilt, and this is just that! 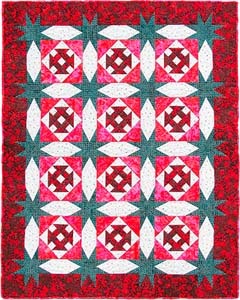 The quilt consists of many patterns as well as a pieced sashing to add interest. There are quick methods for the basic block and a new way to do paper piecing for the sashing. Color is important, you need to be aware of what colors are going where ….. we want those stars to pop out both in the sashing and in the border. So be creative in your color selection, I’ve seen a real variety and they all look great!